Penn High School will be hosting a Collegiate Wrestling meet between two NAIA powerhouses, No. 3 Indiana Tech and No. 6 University of Cumberlands. 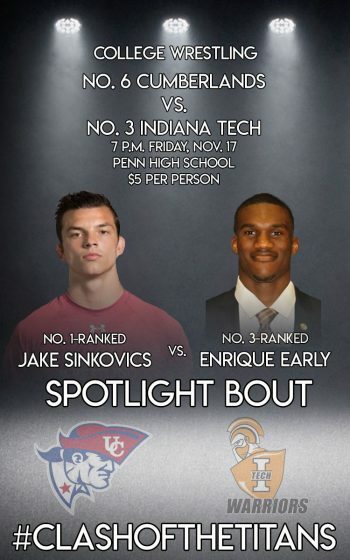 The match is scheduled to start at 7 p.m. on Friday, Nov. 17, at Penn High School’s Main Arena (Enter at Door D). Tickets are $5 a person. Doors open at 6 p.m.
Former Penn star Austin Slates wrestles for Cumberlands, and another ex-Kingsmen wrestler, Alex Gregory, is on the Indiana Tech coaching staff. Former area athletes who are on the Cumberlands and Indiana Tech rosters include Tristan Macri (Mishawaka), Jake Sinkovics (Mishawaka), Tyler Moser (Bremen), D’Angelo Scott (Washington), and Chase Hack (Riley).